Like I mentioned on the post about Sydney's half-arsed attempts to implement bicycle infrastructure, it doesn't do much good if you don't go all the way. My mate Joel took this shot in Torino, Italy. Great bike lanes and then a No Cycling sign. Hmm. I'll admit that I don't know the details of this location. Perhaps this spot is a one-off. There are many cities in Italy that are well ahead of the game regarding bike infrastructure. Flat cities and hilly cities alike. Nevertheless, this is a good example of how to do it wrong. City planners with good intentions but without the political backing to go all the way? This shot is from Hamish in Toronto. Another example of duh. Although this is a behavourial issue more than anything, that bike lane could easily be graded - raised up with a kerb - to physically separate it from the traffic. 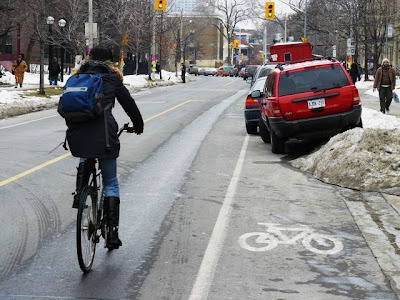 Oh... and buy yourselves some bike lane snowploughs.